That's how many Chevrolet Express Cargo Vans AT&T will get from The General. The dozen hundred vehicles will go into service across the country and are part of AT&T's much larger initiative to green up its fleet. From electric vans to other electric vans to hybrids, the company has invested in a variety of alternative powertrain vehicles. It pretty much has to look at many options if it wants to reach its target of deploying 15,000 alternative power vehicles by 2018. This $545-million project started in 2009; the 5,000th vehicle joined the fleet last week. The 1,200 new GM vans are all Chevrolet Express models that have been built at the factory to burn CNG in their Vortec 6.0L V8 engines. GM says the modifications include "hardened exhaust valves, and intake and exhaust valve seats for improved wear resistance and durability with gaseous fuel systems." The fuel may burn cleaner than gasoline, but these are still fuel-hungry monsters that get a gasoline-equivalent fuel economy of 11 miles per gallon (city) and 16 mpg (highway), according to previous statements from GM, which also indicated the CNG versions cost an extra $14,590 compared to regular gas vans. AT&T's order is the latest in a bit of an upsurge in CNG vehicles in America and around the world. The Honda Civic Natural Gas won the 2012 Green Car of the Year award at last year's LA Auto Show and is the first passenger car to be available in all 50-states. CNG has long been more popular in the fleet market than in general use, since fleet managers can calculate the cost benefits fairly easily, just ask Waste Management or the AT&T of last March, which ordered 100 CNG-powered Chevy Express vans. If everything goes as planned, AT&T should have around 8,000 CNG vehicles in its fleet sometime this decade. DETROIT – AT&T plans to take delivery of 1,200 Chevrolet Express compressed natural gas (CNG) dedicated cargo vans to be deployed to AT&T service centers nationwide. It is the largest-ever order of CNG vehicles from General Motors. AT&T, which has announced its intention to invest up to $565 million to deploy approximately 15,000 alternative fuel vehicles over a 10-year period through 2018, will use the vans to provide and maintain communications, high-speed Internet and television services for AT&T customers. Last week, the company announced the milestone deployment of its 5,000th alternative-fuel vehicle, a Chevrolet Express van, as part of the commitment. "CNG technology is important to AT&T because it helps us reduce our fleet-based carbon emissions," said Jerome Webber, AT&T vice president of Fleet Operations. "It is also cost-effective and readily available in our country right now." According to the U.S Environmental Protection Agency, CNG-powered vans can produce approximately 25 percent fewer carbon dioxide emissions than similar gasoline and diesel-powered vans, which supports AT&T's corporate commitment to minimize its impact on the environment. "There are millions of fleet vehicles on the road today and we want to be a critical part of this sustainable revolution, helping make these conversions as easy as possible," said Brian Small, general manager, GM Fleet and Commercial Operations. 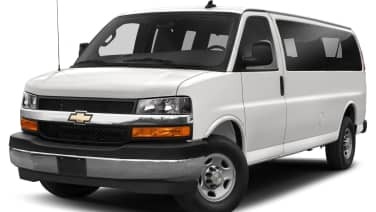 Chevrolet Express CNG vans are powered by a Vortec 6.0L V8 engine equipped with hardened exhaust valves, and intake and exhaust valve seats for improved wear resistance and durability with gaseous fuel systems. The vans are factory ordered and delivered to customers with their factory-engineered and fully integrated gaseous fuel system in place, completely ready for work. The CNG option is available for order on Chevrolet Express 2500 and 3500 Cargo vans. Each van is covered by GM's three-year, 36,000-mile new vehicle limited warranty and five-year, 100,000-mile limited powertrain warranty, and meets all Environmental Protection Agency and California Air Resources Board emission certification requirements. The GM Fleet and Commercial Customer Service LinkedIn group offers a discussion forum for Chevy, Buick, GMC and Cadillac fleet vehicle owners. General Motors Co. (NYSE:GM, TSX: GMM) and its partners produce vehicles in 30 countries, and the company has leadership positions in the world's largest and fastest-growing automotive markets. GM's brands include Chevrolet and Cadillac, as well as Baojun, Buick, GMC, Holden, Isuzu, Jiefang, Opel, Vauxhall and Wuling. More information on the company and its subsidiaries, including OnStar, a global leader in vehicle safety, security and information services, can be found at http://www.gm.com.